Grid-tied systems are the most common type of solar PV system. Grid-tied solar systems generate electricity for your home or business to use, when there is no demand for the energy, the solar panels send excess electricity back out into the grid for use elsewhere. and the electric utility company retailer offer you a feed-in tariff rate. Grid-tied systems do not need to produce 100% of the electricity demand for a home or business but should be designed large enough to offset your daytime use. 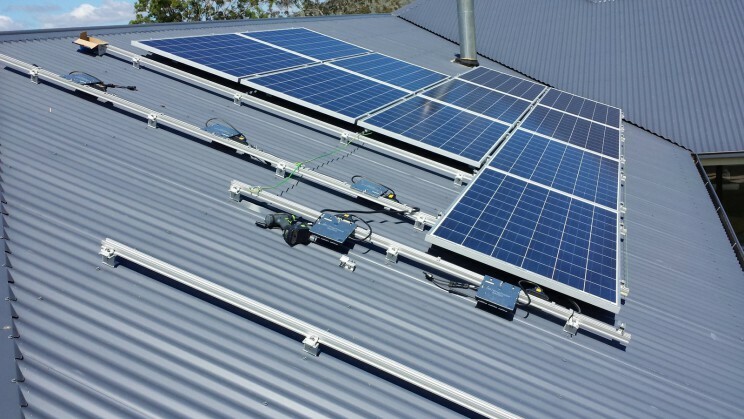 Grid-connected PV system consists of solar panels, one or several inverters, a power conditioning unit and grid connection equipment. With Grid connect solar there are three distinctive systems you can buy, A string inverter system, micro inverter system and hybrid inverter. These systems do exactly the same thing in producing power form the sun and supply your home and feed excess to the grid. The far more prolific, conventional systems have only 1 centralised inverter for the entire solar panel array. In a grid Tie system the panels are wired in series which increases the voltage, but does not increase the current. This is a good idea in order to prevent the use of large conductors, which are required to carry large amounts of current. When panels are wired in series it is a STRING of panels, hence the term String Inverter. These are the latest-generation of solar system technology which have a number of potential advantages over conventional systems in terms of system design flexibility, ease of installation, installation costs, and system power yields. Micro systems are growing in popularity, numbers, and affordability and completing the management profiling with cloud base accessible data. Micro inverter is assigned to each individual solar panel and are coupled together electrically on the Ac side of the power generation.